Meet QuickSleep - an effortless way to put your Mac into sleep mode. 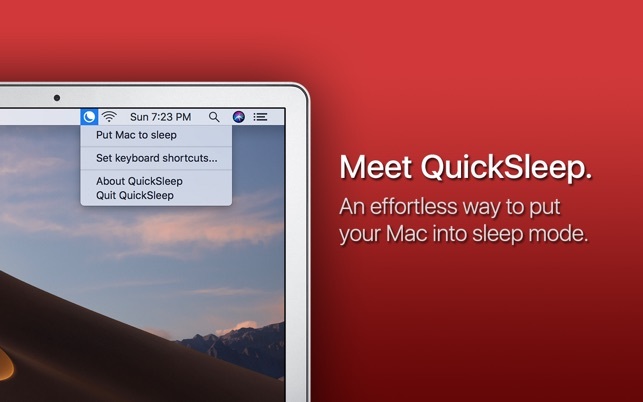 • One-click sleep - With QuickSleep, putting your Mac into sleep mode has never been easier - it only takes one click. • Customizable keyboard shortcuts - QuickSleep allows you to set keyboard shortcuts to put your Mac to sleep without having to open QuickSleep from the menu bar. • Easy-to-use design - QuickSleep is super easy-to-use — it only takes the click of a button to use it. No more scrolling through menus to complete a simple task. • Constant updates - QuickSleep is always being updated, and new features are constantly being added! QuickSleep fully supports Retina displays and macOS' built-in dark mode. QuickSleep is completely free and always will be, with no ads and no in-app purchases. I put it into screensaver mode - info is a bit lacking on how to get it out of screensaver mode once in, short of hitting the power button.